It has been 5 years since I started using Fujifilm X-series cameras. It was Fujifilm X-E1 that opened the door to this camera system for me. Quite a journey. I was thinking what post will I write to celebrate this small anniversary. Frankly, I am not very fond of "Why I switched..." or "XYZ reasons why..." types of stories so I am not going to bother you with that. I am also not going to write about why I use Fujifilm X-series cameras over other systems or brands. Many Fujifilm users already did and stories are all the same. For the most part, I share their thoughts about the matter. Instead, I went through my archive of images taken with the Fujifilm cameras and I picked some of my favourite ones. They are all accompanied by little stories about how they came to be. Let's celebrate the anniversary with photographs, rather than gear talk. Of course, as I expected, it is very hard to make a selection and pick the only limited number of photographs. Attention span is very short these days and even 25 photographs with their respective captions can be too much to view for a busy person. Trust me, my initial selection was much bigger, but I made an effort to cut it down to 25 photographs. So without further ado...let's begin. I was walking on the banks of Perfume river in Hue, the ancient Capital of Vietnam. There was a night market which I wanted to explore. I took few photographs that night but this is the one I liked the most. As I was walking on the riverbank I came close to this girl, got down to knees for better point of view. The noise from the market was louder than the one I made and she didn't notice me for awhile. I took about 3 photographs of her looking towards the market. Then I shifted a little for slightly different framing and she turned her head towards me. I pressed the shutter at the same time she looked at me. I got lucky. Whenever I visit a foreign country, I try to stay away from "tourists" restaurants, coffee shops and attractions. The best way how to immerse in the culture is to experience the "local" way. I walked into this traditional Vietnamese coffee shop in Da Nang. I got myself a Vietnamese drip and watched the bustling life happening outside in the streets. Then I noticed this man who was sitting behind me and enjoying his milk coffee with a cigarette. There is no such a place as the non-smoking coffee house in Vietnam. I didn't want to turn around and take a picture, He was sitting quite close and I would for sure disturb the scene. Instead, l lifted the camera as I would just play with it, roughly pointed the lens over my shoulder and then also under it. I snapped few shots. I checked on the back screen if I got him at least in a frame. Which I did manage to do quite well. It is not the sharpest photo ever but I believe it captures the moment and atmosphere well.. I already have a picture from Kandal market in Phnom Penh and here is another one. As I said that place is great for photography. Just a little patience, smile and open eyes can get you a nice result. Even during a heat of the day, there are photographs to be had. I was actually walking to my hotel. Sun was high in the sky and scorching heat was beating up my brain. I nearly left the market area when I noticed this woman with a child in her arms. She turned towards one of the shops and slowly walked inside.I was few steps behind her with my camera ready and once she walked of the direct sun I quickly snapped this photograph. I like the picture of the baby overwhelmed by afternoon heat and sleeping in the safety of mothers arms. Photograph of this little Sherpa boy is quite possibly my most favorite photograph I have ever taken with an X-series camera. There are a lot of memories tied to this image. I remember exactly every moment, that led to the split second I pressed the shutter. I even made a short video about it since I had a GoPro camera with me at the time. Little Rando Sherpa got really interested in my Fujifilm X100S camera. He almost completely depleted the battery and I had just enough juice left to make about 5 photographs. He got really comfortable with me, the light from the window was nice and soft, the expression of curiosity on his face was priceless. All these ingredients put together created this compelling image.. Watch the short movie here. This is one of the oldest photographs in this selection. I took it with my first X-series camera, the Fujifilm X-E1. The trip to Myanmar happened just 3 weeks after I purchased the camera. I was totally unfamiliar with the system but I instantly feel in love with it.The original XF 35mm lens is optically my favorite Fujinon lens. It is hard to put in words the way how it renders the image but it has its own unique flavour. I photographed this monk in one of many temples one can find in Bagan. 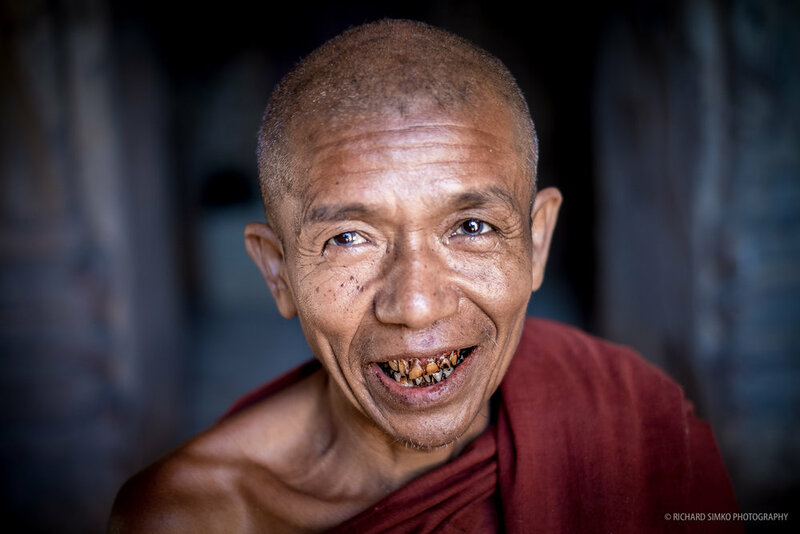 Chewing betel nut is like a national sport in Myanmar :) Besides signs of euphoria and a general feeling of welbeing it had this devastating effect on mouth, gum and teeth health, among many other side effects. He was very friendly and smiled a lot. I missed the focus on his eyes a touch but I believe I captured the state of his dental health perfectly. I have been involved with Cambodian Childrens Fund for almost 5 years. Srey Vy is my sponsored child. I visited her several times in Phnom Penh. One of these activities during the visits are outings in the city. I took this photograph during my second visit. We stopped by at Central Market in Phnom Penh and went for some shopping. Clothes and shoes were high on the agenda (perhaps except school supplies). She picked a dress for herself and after she tried it out she held onto them like her life depended on it. New clothes are something these kids don't really experience. They come from the poorest of families and food is more important to survive. This was a little happy moment for her. The famous "Eagle Huntress", Aisholpan became a celebrity overnight. 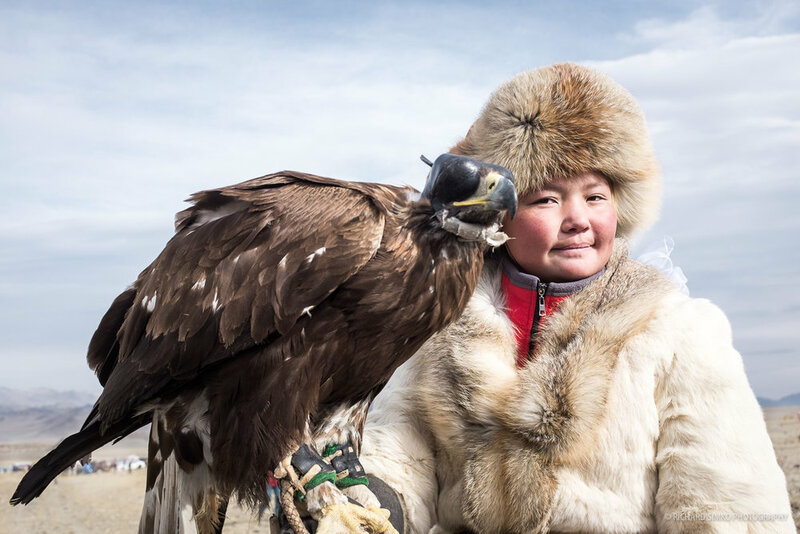 Att the age of 13 she won the annual Eagle hunting festival competition in Olgii, Western Mongolia. Traditionally, girls were not allowed to take part in the competition and her participation was met with a rather cold response from most of the male eagle hunters. At the end, she was allowed to compete and she won. Eagle hunting festival is a busy and crowded event. It is very popular among locals as well as tourists from all over the world. I have never seen so many long telephoto lenses at one spot. She drew a flock of photographers everywhere she went and she posed patiently and with a smile. I was standing not far away from that crowd. I don't know why, after a while, she moved and she moved towards my direction. Luck I guess. I took this photograph of her with Fujifilm X100S before the flock of photographers caught up with her. Here is another picture from Eagle hunting festival in Olgii, Western Mongolia. This particular eagle hunter has a slightly different outfit than other guys had. I didn't really figure out why. For me, this photograph represents who eagle hunters are. Proud people who respect their land and traditions. As if he said, "Here I am, this is my best buddy, a Golden Eagle and this is my country. We are as one." I am glad I managed to get a reasonably good composition with nobody else creeping into the frame and on top of that with 23mm (35mm FF) lens. Anybody who had the privilege to witness the Eagle hunting festival can confirm, it is not an easy task. I love this photograph. It has so many memories attached to it. She is a little girl I met in Cambodia through my friend. Every time I visited Phnom Penh I made an effort to catch up with her. On this occasion, we took her to Sihanoukville. It was her first time at the beach and she just couldn't get enough of water. Hence the nickname I gave her "Little Mermaid". We spend 3 days in Sihanoukville and those 3 days are some of the best in my life. Pure joy is just radiating from this photograph and it instantly takes me back in time. I live through those moments and I feel how happy she was. That makes me feel happy too. I took hundreds of photos on that beach and it was hard to pick one, but I feel this one represents the emotion very well. 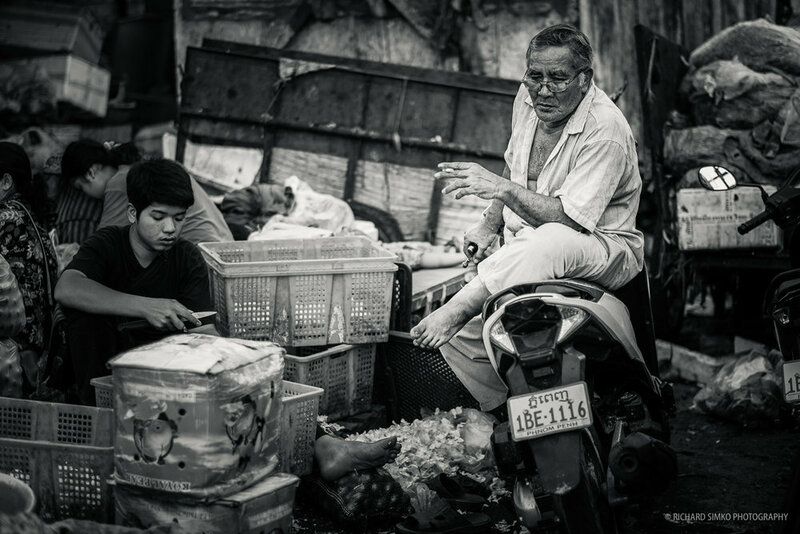 This is my last photograph from Kandal market in Phnom Penh in this selection. I know I have many. Well, I have been to Phnom Penh more times than I can remember. 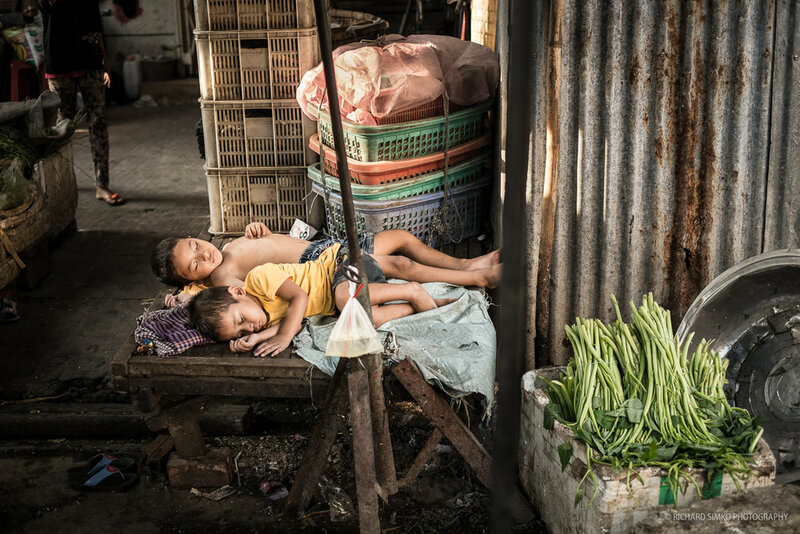 These two chaps took an afternoon nap in the stall where their mom sold vegetables. I walked by when I noticed them. The scene was so peaceful mids the bustling market. I took this picture and on the way home I was lamenting I didn't take more, just to be sure. Upon seeing the photograph on my computer I was relieved. It was in focus and well exposed. I am very happy to say that I saw these two boys during my every subsequent visit to Phnom Penh. They don't know me but I saw them grow over a period of few years. They are doing well. It's things like this I love traveling and photography so much. The sunrise at Angkor Wat is probably one of the most crowded events ever. On one occasion I was little late to get a good unobscured spot. So I decided to go inside the temple. I already photographed the sunrise before anyway. Angkor Wat temple was empty inside at this time except for few employees and 3 novice monks. I know there are traditionalists for whom this kind of photograph doesn't count if it is not taken by wide angle and from close proximity to subject. For me, however, there are no rules. I do things how I see them fit. The long lens worked for me in this case as I was able to stay little away and don't disturb the moment. Calm before the storm of visitors flocks into the temple. The peace of early morning, the calm humming of the breeze and concentrated look of this monk novice contributed to this special moment. I believe he is used to attention and cameras from tourists but at that moment I didn't feel it was right to break the calm of the situation. So I photographed him from the distance and this is the shot I got. I mentioned that light in the streets of Thamel in Kathmandu is very dim early morning or just before sunset. Streets are narrow and building tall, blocking the best morning or afternoon light. I had to set ISO to 6400 for this shot and even that produced a somewhat underexposed image. I was able to recover lots of detail in post. Although not noise free at this high ISO, it is a very usable image. I had printed it in a book and it came out excellent. I've been to Kathmandu several times I recognised the gentleman on the right on some of my other photographs from a few years later. Old Kathmandu has it's unique charm with these ancient buildings and it's people. Scenes like this are happening there just waiting to be photographed. Mother and her child relationship is special. This was a moment when I really appreciated the inconspicuous nature and silent shutter of Fujifilm cameras. 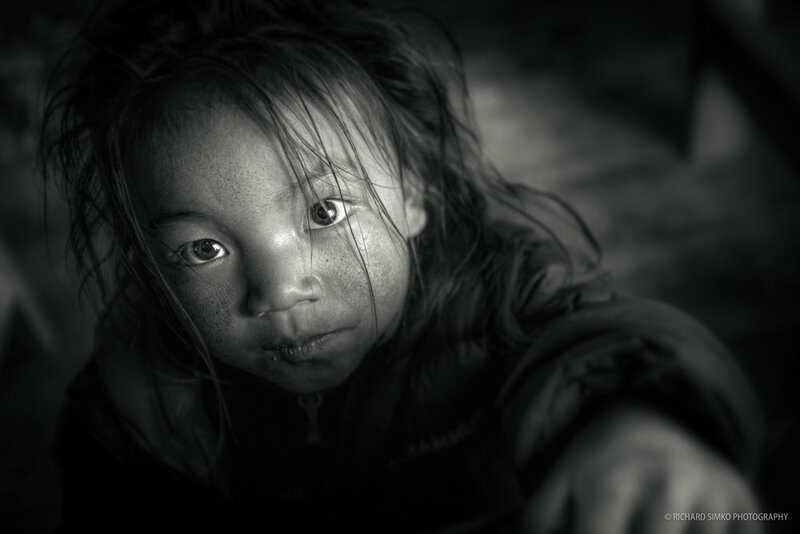 I spent a week in Mongolia living with this nomad family. Their gear was literally in the middle of nowhere hundreds of miles from closest town. The neighbour family lived about 30 min of bike ride away. As we finished dinner I observed the mother cutting the nails of her son. As quiet as I could I grabbed the camera, trying not to disturb the unfolding scene in front of me. It was quite dark inside so my ISO had to go up significantly. Even then the shutter speed was quite long. I managed to get this picture which depicts a scene from the life of Mongolian nomads. I have to add, after many days with them, they got used to the camera and children actually demanded it. At the times it was quite challenging to shoot something without them noticing and demanding a posed image. This 7 day with the family taught me a lot and I am more appreciative of things we consider for granted. The life of a nomad is not an easy one but there is a lot to learn from it. About resilience, resourcefulness, humility, tradition and nature. This sunset shot of Bagan temples is also from my first ever trip with Fujifilm X-series cameras. Everything happened at the right time. Sun has just dropped from behind the cloud, a flock of birds just passed by, beautiful god rays just appeared in the sky. What else can one ask for in the photograph? Composition wise I wish the temple and the sun were a little closer to each other or perhaps it would improve is there were at least one or two dominant temples in the picture. It was too late to move as we climbed up on another temple to get this view. After this, I had few more sunsets in Bagan but none of them was as nice as this. Beautiful place. Next time I should do my research and scout the location better but I am still very pleased with image and it convinced me that this camera system is doing actually pretty good. Life of a nomad people is tied to domestic animals. In fact, they are is one of the reasons for nomadic life. Nomads depend on these animals, and animals depend on nomads. And pastures. If good pastures are scarce, it is time to pack up and move to a better place. Nomads wake up early. There is a lot of things to be done and among the most important ones is taking the goats, sheep, camels, horses to a pasture. And then at the end of the day, they are headed back to a closure to protect them from wolf attacks. I spent a night at Kazakh eagle hunter's house. I also woke up early in hope of getting some nice photographs and I was rewarded for my efforts. A nomad with a herd of goats was passing by. The animals were kicking up a lot of dust with rising sun coloring everything in gold. Al these elements together created this lovely monochromatic scene. I just noticed that all of the images in this selection but one has a human element. I believe a human presence completes the picture. Photograph with goats only wouldn't be so strong because the herd and the herder belong together. In 2015 I climbed Khuiten, the highest peak of Mongolia. It is located at the western tip of the country in mighty Altai mountains. The base camp is located far away from the point we could reach by car. To transport all the equipment and provision we used camels. One of the strongest and most resilient animals out there. After a last very cold night at the base camp, we packed everything and loaded the camels. Sunrise that day was sunning and a day was turning out to be a nice one too however it was freezing cold. I captured this photograph just as the camels were leaving the base camp. We soon followed. I love this photograph because it reminds me of the natural beauty of Altai, kindnes and hospitality of local people, unforgettable experience and friendships I made. The Australian sun is strong and hot. They say it is not a good idea to photograph when the sun is high in the sky. Well, with infrared photography that is actually a requirement so to speak. I went for a walk to Centennial Park. I had a camera, lens and also an IR filter. 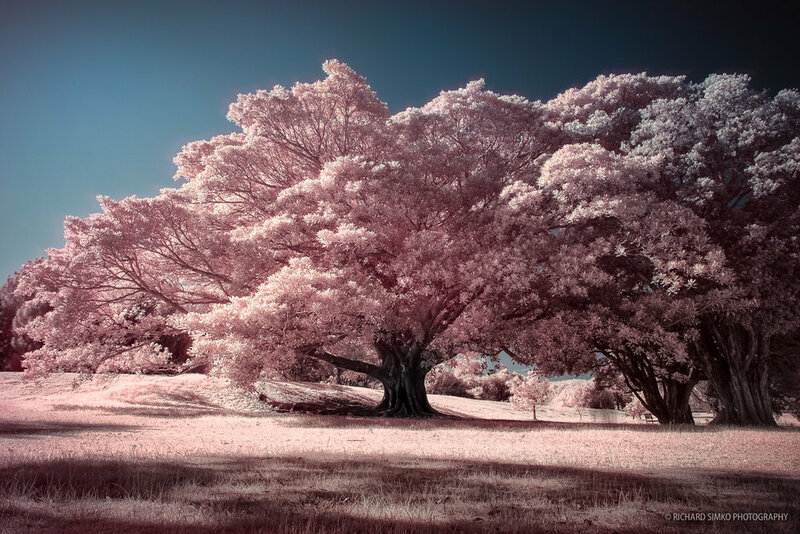 What I didn't have was any sort of experience with infrared photography. I knew the theory but you know how it is. Until you try it yourself you don't know anything. I set up the camera in front of this beautiful tree. Even though it was bright outside, the IR filter cut a lot of light and the exposure was quite long. There was no wind but I had people walked into my shot. Thanks to long exposure there is only a smudge left after them. I am also pleased with my false color editing of this photograph. Also my first ever, just like infrared photography. 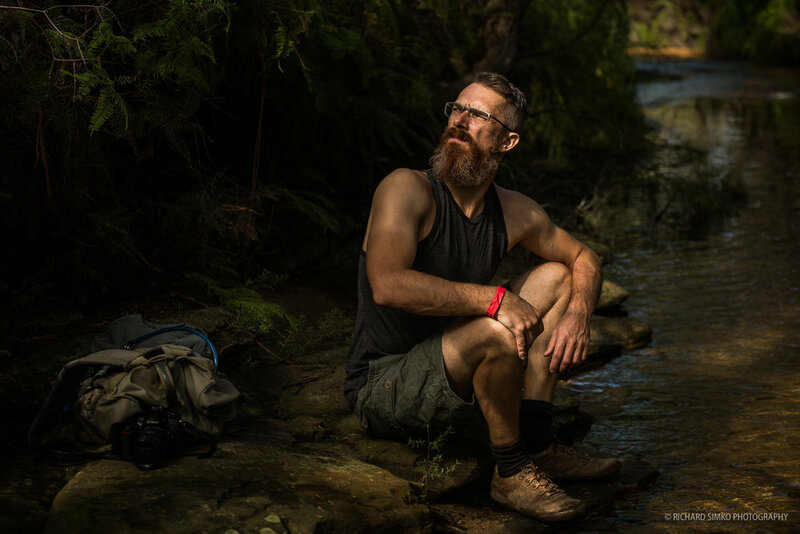 I photographed my friend and colleague Etienne on Wentworth Falls train in Blue Mountains, Australia. There was this nice scene with creek and dappled lighting which I thought would be a nice setting for a photograph. I directed Etienne in such a way that his face was nicely lit by the sun while rest of the scene was either in shadow or lit by broken dappled lights coming from the trees. Although bit stiff in his pose the image came out great. The light was excellent and I didn't have to do too much in the post. It looks like a painting. In fact, a friend of mine cut out Etienne in Photoshop and placed it into a Caravaggio painting. Just for fun. I thought it looks great.. Take a peak. Angkor Wat is the sole destination for almost everybody visiting Siem Reap in Cambodia. There are very few that look or venture behind the temples. For me, however, the life in a traditional Cambodian village is as interesting as the temples. I hired a bicycle, picked a random direction and just of I went. At another random place I left the main road and after few more kilometres, I found myself in a quiet village. When I reached the rice fields behind the village I got off the bike, sat down and tried to take in the scenery. After a whole, I hear voices and bunch of kids came out of the bushes. Drawn by natural curiosity they came to see the big white guy who ventured into their village. Not a common site as the village was well off the path of traditional "temple viewing" routes. Kids were curious and not shy at all. I noticed this unbelievably beautiful little girl among them and took her photo. They loved to see the picture at the back of the camera. After that, I pushed the bike walking back to the village with all kids following my footsteps. I met with a woman who was probably her grandma, I bought some water and fruit from them and tried to have a "conversation" with few Khmer words I learned. They were all smiles. When I rode off on the bike I kept looking back and I still saw this little girl. What a lovely experience. This photograph was taken above 6000m during an unsuccessful climb to Chulu West in the Himalayas. We spent 2 days in a base cam waiting out the bad weather. After 2 days the skies cleared out but the strong wind continued bashing our tent. We were running out of food, the dinner day before was just instant noodles. Nutrition value of such a food in high altitude equals to zero. Yet in the morning with a clear sky, we decided to give the climb a go. After a hard battle in deep snow, icy slopes, crevasses and mainly gale storm winds Ngima looked at me and I knew we won't see the summit today. It was too dangerous to continue the climb and it was freezing cold (climbed in December). We were about 100 vertical metres below the summit. So close, yet so far. I took out the camera and with frozen fingers, I snapped few shots of Ngima. He is a super climber with 3 Everest and 5 Makalu summits under his belt. I was nowhere near his strength and experience. I took this photograph during Wentworth Falls hike in Blue Mountains, Australia. I primarily wanted photographs of the falls. This was one of many and it had a reasonable amount of water. Perfect subject. This hike is very popular and there are hikers along the trek and it is hard to get a clear shot. But with some patience it is possible. However, at this particular spot, a canyoning group was occupying the falls. There was still a large group of people waiting to abseil the waterfall so I tried to make the most of the situation. I noticed a spot in the middle of the falls that was accessible and close to a rope. I had my wide lens on and waited for the right moment. I think I got it well and the wide angle lens created quite a dynamic composition. One of my visits to Bangkok happened during the time of demonstrations against Yingluck government. There were crowds at Silom and Sukhumvit. I spoke to some locals and they said that Abbisith Vejajiva was about to have a speech. So I waited a little longer. Actually for hours. Then he showed up and had his speech. The crowd cheered and as he was leaving people followed him. It was quite difficult to get anywhere close. My strategy was to go little ahead and find a clear spot somewhere where he supposed to pass. At the end, I got lucky and got my shot of former prime minister in the middle of the cheering crowd. This photograph closely follows the previous one. I took it just about an hour later as I was following the march led by the former prime minister. This gentleman followed the proceeding is his car waving a flag of Thailand in the car window. He stopped often as there was very little room for a car. I came close as he was waving the flag and sounding the horn. He noticed my presence and looked at me. I nodded my head asking for permission to take a picture without a word said. He smiled and lifted his hand closed into a fist showing the determination and defiance. That was the moment I pressed the shutter.